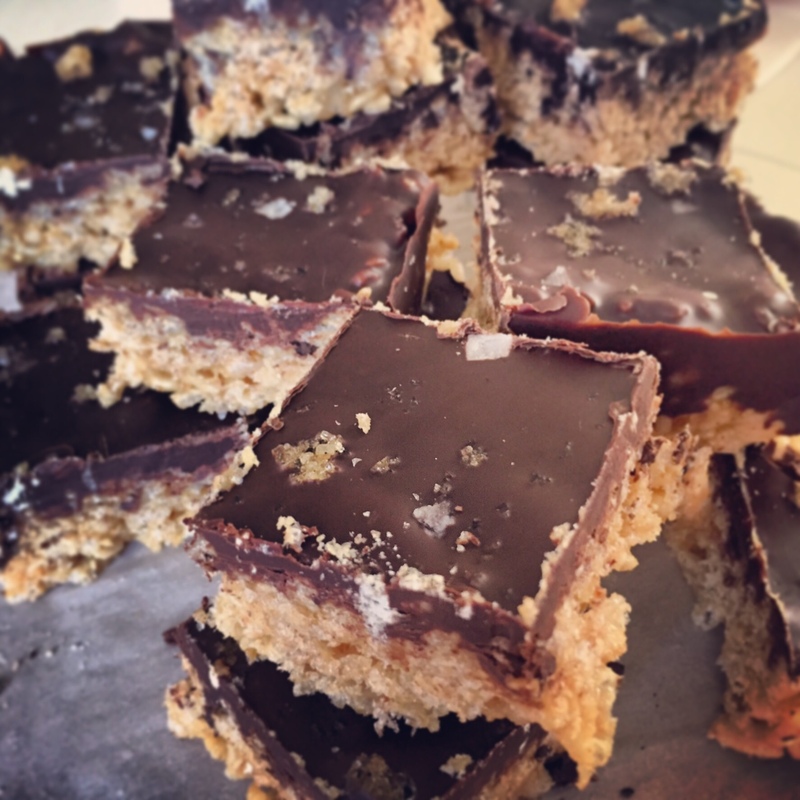 Peanut Butter Rice Crispy Treats – A Healthy Pinch. Rice crispy treats are practically a staple of childhood, am I right? I distinctly remember frequently making these, either at home with my mom or at friends’ houses. The best part was definitely not waiting for them to cool, but to grab the gooey warm bits and pieces before they even hit the pan! These treats are reminiscent of a more innocent time, however, nowadays I try to be a bit more mindful of the ingredients I use when making my desserts. If I can substitute a whole grain or healthy fat, I will. This is a super easy recipe and it comes together quickly, no baking required! Now I can’t take full credit as I saw this on Sprouted Kitchen’s Insta feed, but it was necessary that I make them immediately and just had to share! Plus, I had recently made a batch of Bourbon Vanilla-Bean Sugar and these peanut butter rice crispy treats were the perfect accompaniment. Combine peanut butter and brown rice syrup in a small sauce pan and warm together. Stir to combine. Once combined, add in vanilla and sea salt. Pour warmed peanut butter/brown rice mixture over the crisp brown rice in a large mixing bowl. Using a rubber spatula, fold ingredients together until everything is coated. Empty contents of bowl into a greased 8×8 pan and even everything out with a spatula. Melt chopped chocolate with coconut oil either in microwave or double boiler and pour over brown rice mixture. I used flaked sea salt and my homemade bourbon vanilla-bean sugar to give it some crunch and depth of flavor. Cocoa nibs or toasted coconut flakes would work as well.